Manitowoc has announced a new four axle Grove All Terrain crane, the 90 tonne GMK4090, an upgrade to the current GMK4080-1/GMK4100B which has been in production since 2006. The new GMK4090 features a 51 metre six section Megaform boom with the Grove Twin-Lock boom pinning system. A nine to 15 metre bi-fold swingaway can be further extended with a six metre insert between boom nose and extension, taking the maximum tip height to 75 metres. The new crane has an overall width of 2.55 metres and can travel with up to 9.1 tonnes of counterweight on board within 12 tonne axle weights, or up to 18.3 tonnes where heavier loadings are permitted, such as in the UK. Tailswing is 3.53 metres, allowing it to stay within the outrigger footprint. Grove’s MAXbase variable outrigger set up system is available as an option. 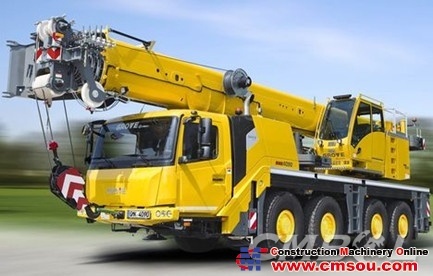 The company’s Crane Control System (CCS) is standard. A lower counterweight 80 tonne version – the GMK4080-2 - will also be available outside of North America. The GMK4090 be available globally.